The four women went to the Hongsecun People's High Court in south Beijing in a symbolic protest against what they said highlighted the "lawlessness" of China. The court has surpassed the time limit prescribed by law in dealing with case detained lawyer wife said. 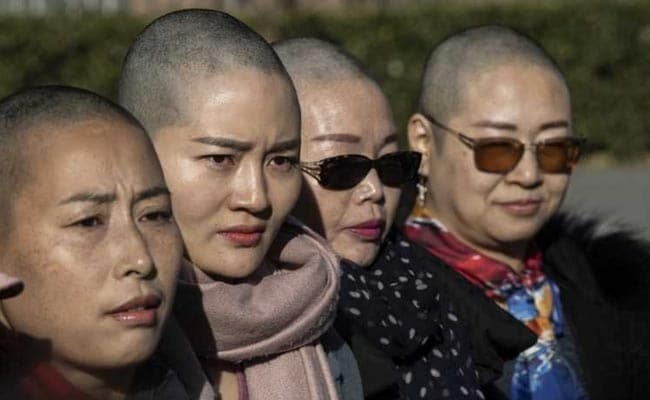 The wife of a detained Chinese lawyer and three supporters shaved their heads today and attempted to submit to a Beijing court a petition protesting her husband's indefinite detention. The four women went to the Hongsecun People's High Court in south Beijing in a symbolic protest against what they said highlighted the "lawlessness" of the country. "We can go bald, but the country cannot be lawless," the four women shouted outside the courthouse after they were prevented by police from entering the premises. The Chinese words for being completely bald and having a state of lawlessness -- "wufa" -- are homonyms. Their husbands were all targeted during a sweeping crackdown on activists and lawyers on July 9, 2015. Attorney Wang Quanzhang, who defended political activists and victims of land seizures, disappeared in the sweep aimed at courtroom critics of Communist authorities. Charged in January 2016 with alleged "subversion of state power", Mr Wang is the only one of over 200 lawyers and activists arrested in the so-called "709 crackdown" who is yet to be tried or released. "My husband is being detained incommunicado without a proper explanation," Wang's wife Li Wenzu told news agency AFP. "I want answers as to why the authorities aren't following due process. I want to know why they aren't allowing the family's lawyer to visit Wang," Ms Li said. Ms Li said over the past three years she has submitted over 30 freedom of information requests to police, which have been sent back unanswered. In April, Ms Li attempted to march 100 kilometres (60 miles) to a detention facility in neighbouring Tianjin to highlight her husband's plight before she was thwarted by police. "I want to urge the Supreme People's Court to perform its supervisory duties and investigate why the second intermediate court in Tianjin that is handling my husband's case is dragging its feet," Ms Li said. "The court has surpassed the time limit prescribed by law for dealing with such cases," she said. Liu Ermin, wife of rights activist Zhai Yanmin, said she was protesting her husband's torture while in detention. "His health has deteriorated and we are still under constant surveillance," Ms Ermin said. The third woman was Ms Yuan Shanshan, wife of lawyer Xie Yanyi. Mr Xie, who defended practitioners of the banned Falun Gong spiritual movement, was released on bail pending trial in January 2017. He has since shed light on the torture of detained lawyers. Ms Wang Qiaoling, wife of lawyer Li Heping, also joined the protest. Li Heping was given a three-year suspended jail term in April 2017 for subverting state power. Three years after what activists say was a coordinated attempt to quash China's rights movement, most of those detained are in prison or under house arrest. Some of them made public confessions and were sentenced in what their families say were either secret or scripted trials. Some of the cases have attracted international attention.